Boleck is very special by character. All the time he followes you, tries to climb up your leg, always ready to play. He is hyperactive like a quicksilver. It is really very difficult to catch a moment to make a good picture of him, and when ultimately you click, you get only his back in the photo. He likes to be caressed and kissed. He is very sweet, indeed. 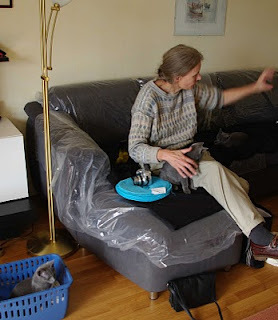 Today he joined his brother Baduric in the very friendly family of Adriana Oele and her two older cats in Den Haag. ...Bolle is doing fine, he is indeed a cat that wants humans constantly very close whereas Badu keeps a bigger distance. He seems to me very intelligent. He is smaller than his brother but moves faster and more precise. They both like very much to sit on my laps, and now they nearly constantly do things together. The company of Bolle improved the situation for Badu because he was rather alone last week. So, it was a good decision to get them both and I am very happy. Warm regards from me and my russian blue family!